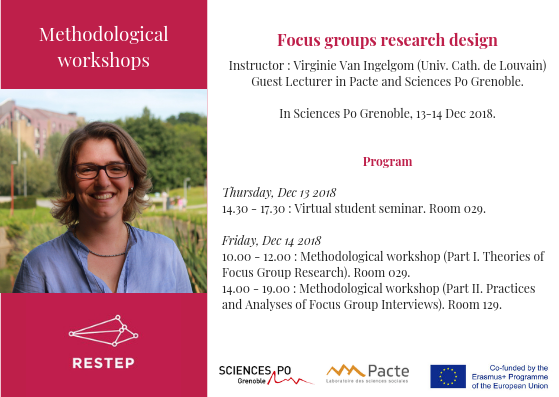 Our partner Sciences Po Grenoble will host next RESTEP methodogical workshop on Focus Group Research Design on 13-14 December. Instructor is Virginie Van Ingelgom, Research Associate Professor F.R.S. – FNRS at the Université Catholique de Louvain (Belgium). The workshop will be in English. Focus groups have become quite fashionable in social science over the last decade, notably because they give access to a a great richness of discourse and interactions. However, they are generally more demanding than expected. Using focus groups not only requires more resources than other qualitative methods; it also involves a series of decisions concerning the different technical aspects involved, from design and organisation to analysis. Many decisions require one to be very clear about one’s research objectives. This course will introduce to a variety of uses for focus groups, in terms of epistemology and research topics. The complete process of organising a focus group will be discussed – including typical problems like sampling, designing questions and moderation, but also practical considerations in terms of setting the room, recording, contacting, selecting and rewarding participants. Finally, focus group discussions are more complex to analyse than standard face-to-face interviews, so an important part of the course will be devoted to analysis.